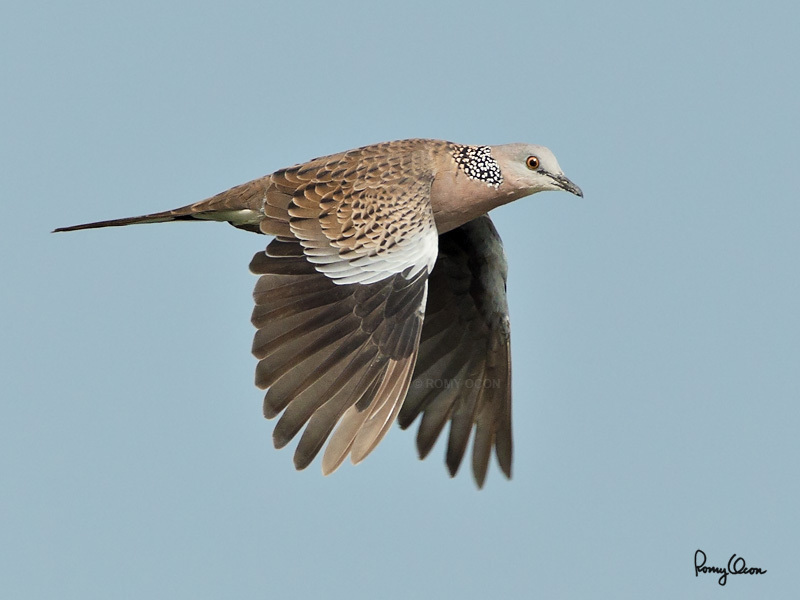 This medium sized dove (total length of 12 inches) ranges in all major Philippine islands. The black collar with white spots at its nape is probably the source of its name. It actually reminds me of a bar code…. maybe these birds scan the collar to recognize one another? I was shooting water birds at Manila Bay when I noticed this bird flying very fast in a straight trajectory towards my position. I fired a long 10 fps burst, and one frame caught the bird’s wings in a photogenic downstroke pose, showing the overwing patterns and diagnostic spotted collar pretty well. Habitat – Open country and agricultural areas, forages on the ground. Shooting Info – Coastal Lagoon, Manila Bay, Philippines, September 27, 2010, Canon 1D MIV + EF 500 f4 L IS + Canon 1.4x TC II, 700 mm, f/7.1, ISO 400, 1/1600 sec, manual exposure in available light, 475B/3421 support.